It is the final years of the Great Depression, and Bob Curtis is one of Canada’s countless unemployed. “Seeking a way out” (Allan 86), he marches over the Pyrenees and enters into history by joining the International Brigades­–men and women from around the world who volunteered to fight against fascism in the Spanish Civil War. His fellow volunteers present a cross-section of the North American anti-fascist movement: the French-Canadian Lucien; Doug, an African-American stockyard worker; the bohemian Allan; Harry, a miner, union organizer and family man; and Milton, a young Jewish man with military experience. The men share the excitement and horror of defending the Spanish people against fascist bombardments, until an injury sidelines Bob to radio broadcasting work in Madrid. There, he falls in love with Lisa, a German photojournalist, and he struggles to reconcile his desire to be with her with his drive to return to his comrades at the front. 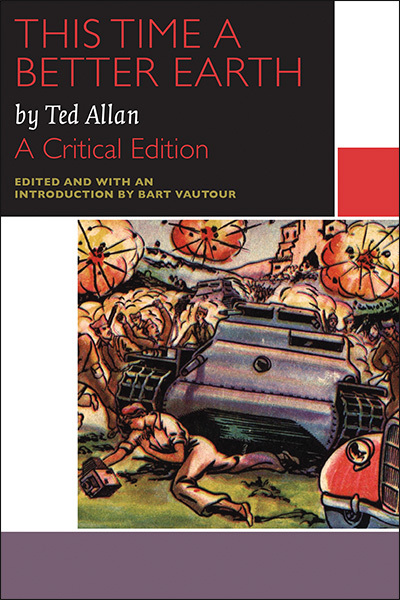 Ted Allan worked as a journalist during the Spanish Civil War, and he brings his own passion and experience to his writing. This Time a Better Earth is a war novel, a bildungsroman, a love story, and a window into an important moment in Canadian history, when Canadians committed their art and their lives to an international struggle against fascism.